This is a well covered subject, but it's worth taking a quick look at the combined balance sheets of the developed economies' (DE) central banks. We are quickly approaching six trillion dollars. 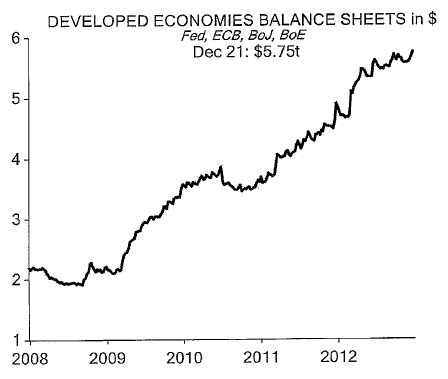 It is important to note that not all of this would qualify as "QE". For example the Fed expanded balance sheet in 2012 without materially impacting either the bank reserves or the monetary base (see discussion). Although it was unintentional, the Fed effectively "sterilized" its purchases. The ECB also views some of its programs as sterilized. Nevertheless it is expected that the developed nations' central banks will expand their balance sheets by another 1 trillion dollars in 2013. This will be driven mostly by the Fed and the BOJ (see discussion). And unlike last year, the US monetary base will grow sharply in 2013 (and so will Japan's). Central banks continue to feed the markets' addiction to stimulus (see discussion).